4/29/2012Share this story on Facebook! 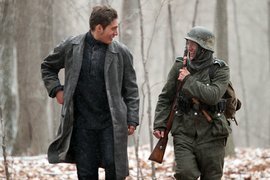 Director Michael William Reyes '12 walks with lead actor Eric Schaum '15 on the set of "Der Kampf." The Roy H. Park School of Communications offers a B.F.A. degree in Film, Photography, and Visual Arts. When B.F.A students reach their senior year, they take Thesis Cinema Production, a class where students produce their own film and hold cast or crew roles in their classmates' films. Senior Michael Reyes '12 served as director, writer and producer of his own thesis film while helping out on other students' projects as well. 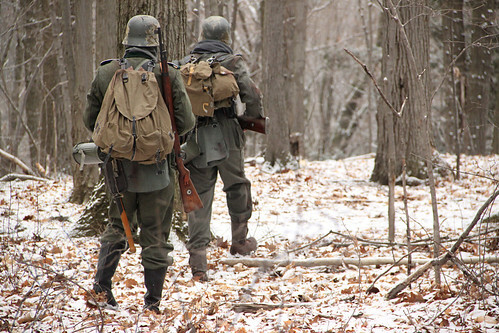 Lead actors Miles Crosman '12 and Eric Schaum '15 trudge through the woods on the set of Der Kampf. The soldiers dropped their guns, and a dozen people scurried around the forest, moving the camera and shaking their feet to stay warm. They had been filming for hours, standing outside shivering to get the perfect shot. Some nine hours later, the crew left the forest and snow behind for their warm beds, only to wake up the next day and do it all over again. It would have been easier to shoot on a sunny day, to write a script that didn’t take place amidst a Polish winter during World War II. But director Michael Reyes '12 wanted to make a real movie. The senior film, photography and visual art major started writing his script for Der Kampf, his senior thesis film, when he was a freshman. Now, a few weeks after the freezing days of seeing his vision come to life on set, Reyes said the harsh weather was a challenge, yet a blessing. The harsh Ithaca winter was the perfect setting to suit the story line. “The film actually gained from that challenge because of the weather and how the picture looks now, and I think we did a nice job maintaining continuity,” he said. The crew deals with the bitter cold on the set. Der Kampf is about a young German soldier flung into the whirlwind of World War II. As the war drags on, he finds him conflicted between his sense of morality and the actions of the Nazi party. To enhance the period look of his movie, Reyes decided to shoot the project on film. (From L to R): Grant Harrison '14, Justin Westfall '13, Wade Ferrari '13, and Eric Schaum '15 prepare for the next shot. Senior television-radio major Chris Fatta '12 served as the principal sound designer for Der Kampf. He said one thing that makes the thesis project unique is the collaboration of students among different schools at the college. “We had Dillingham actors working in a Park School production with the Music School students recording the music,” Fatta said. The film has an original score composed by Ben Van De Water '14, a sophomore composition, theory, and instrumental music major. Fatta, along with Eric Brown '14, a sophomore sound recording technology major, recorded the orchestra in Ford Hall. Though Reyes created Der Kampf for his Thesis Cinema Production class, he wants the film to find a much larger audience than at the end-of-the-year student film screening. After graduating in May, he plans to enter the film in independent film festivals. Despite all the time, money and dedication it took to create the film, Reyes said the production process doesn’t seem like a sacrifice. Click the slideshow below for more behind-the-scenes photos by Fuse photographer Jacob Lifschultz '13.